The pretence to knowledge | Utopia – you are standing in it! This entry was posted in applied price theory, applied welfare economics, energy economics, environmental economics and tagged offsetting behaviour, The fatal conceit, The pretence to knowledge, unintended consequences on August 29, 2018 by Jim Rose. So that's Lucas (1988) looping together Stigler AND Sims as ennemies of utopias. And Lucas is the "schizophrenic, utopian" one. This entry was posted in applied price theory, applied welfare economics, comparative institutional analysis, economics of bureaucracy, history of economic thought, Public Choice, Robert E. Lucas and tagged The pretence to knowledge on August 23, 2018 by Jim Rose. This entry was posted in economics of regulation, environmental economics and tagged nanny state, The pretence to knowledge, unintended consequences on August 23, 2018 by Jim Rose. This entry was posted in economic history, economics of information, economics of religion and tagged metric system, The pretence to knowledge on May 21, 2018 by Jim Rose. This entry was posted in applied price theory, economics of media and culture, economics of regulation, industrial organisation, politics - New Zealand, politics - USA, survivor principle and tagged net neutrality, The fatal conceit, The pretence to knowledge, unintended consequences on December 17, 2017 by Jim Rose. This entry was posted in Adam Smith, applied price theory, applied welfare economics, Austrian economics, comparative institutional analysis, constitutional political economy, development economics, history of economic thought, Public Choice and tagged central planning, The fatal conceit, The pretence to knowledge on June 20, 2016 by Jim Rose. This entry was posted in applied price theory, applied welfare economics, comparative institutional analysis, constitutional political economy, economics of media and culture, economics of regulation, entrepreneurship, environmental economics, industrial organisation, liberalism and tagged offsetting behaviour, The fatal conceit, The pretence to knowledge on May 20, 2016 by Jim Rose. This entry was posted in applied price theory, comparative institutional analysis, constitutional political economy, economic history, economics of media and culture, economics of regulation, industrial organisation, survivor principle and tagged industry policy, picking winners, The fatal conceit, The pretence to knowledge on April 27, 2016 by Jim Rose. This entry was posted in Austrian economics, comparative institutional analysis, constitutional political economy, development economics, economic history, economics of media and culture, growth miracles and tagged Bill Easterly, The Great Escape, The pretence to knowledge on April 24, 2016 by Jim Rose. 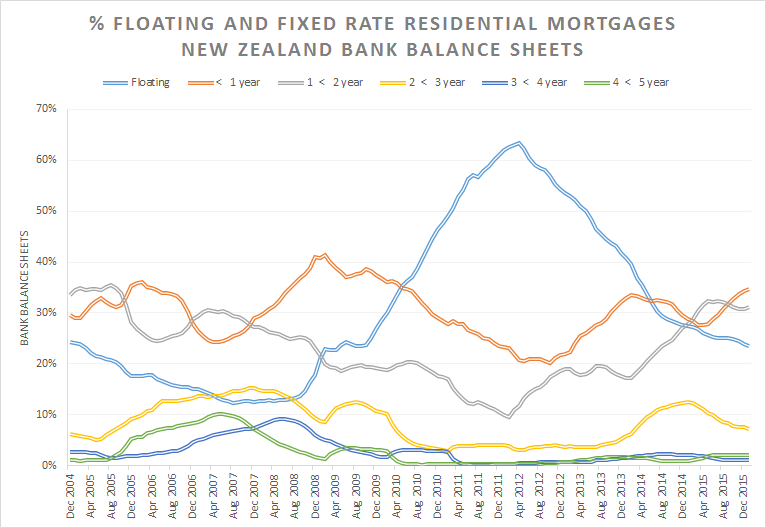 Despite the best efforts of the libertarian paternalists to sell the other people are stupid fallacy, ordinary New Zealanders are quite nimble at moving between fixed and floating rates depending upon their forecasts of the future of interest rates. Price controls on floating rate mortgages, as suggested by the New Zealand Labour Party, would make this more difficult, not easier. Source: S8 Banks: Mortgage lending ($m) – Reserve Bank of New Zealand. This entry was posted in economic history, economics of information, economics of regulation, monetary economics, politics - USA and tagged antimarket bias, libertarian paternalism, monetary policy, mortgage interest rates, New Zealand Labour Party, Other people are stupid fallacy, rational irrationality, The fatal conceit, The pretence to knowledge on March 16, 2016 by Jim Rose.